Vietnam is a country in Southeast Asia, and home to many spicydishes - Vietnamese food can be a mouth-watering treat! Vietnamese dishes are known for using lemon grass, lime and kaffir lime leaves. Fresh vegetables and fresh herbs are often eaten as side dishes with dipping sauces. Many dishes use meat (principally beef, chicken or pork) or seafood (especially cockles and pork), but there are also many vegetarian dishes. 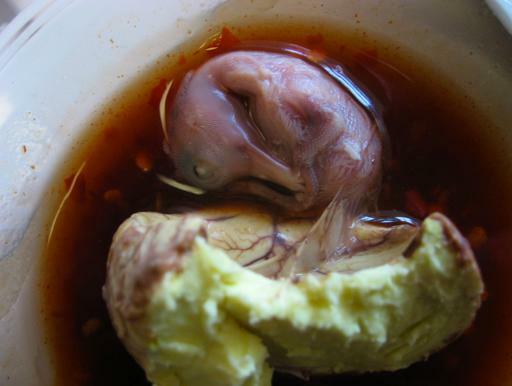 Balut - A fertilized duck or chicken egg containing a nearly developed embryo. The egg is boiled and usually eaten from the shell. Baluts are sometimes claimed to have aphrodisiac properties. Ban canh - A noodle soup contain thick rice noodles. Chicken, crab, pork, shrimp and spring onions may be used in the soup, and cooked onions sprinkled on top. Banh bao - A steamed dumpling sutffed with mushrooms, onion or vegetables. Banh beo - Small rice pancakes topped with minced shrimp and other ingredients. Banh xeo - Pancakes made from rice flour with either coconut milk or water and turmeric. They are stuffed with beansprouts, pork, and shrimp, and then pan-fried. Banh cuon - A pancake made from rice flour, rolled up and filled with ground pork, and other ingredients. Banh hoi - Extremely thin noodles woven into bundles. It is often eaten with spring onion and a meat dish. Ban xeo - A pancake made from rice flour with turmeric, shrimps in their shells, fatty pork, button mushrooms and sliced onions. It is normally eaten with lettuce and a peanut butter sauce. Bo kho - Beef and vegetable stew. Bo la lot - Spicy beef in a pepper leaf. Bo luc lac - Cubes of cooked marinated beef served over watercress, tomatoes and onions. This dish is usually eaten with rice. Bun cha - Shredded grilled pork and vermicelli noodles over a bed of salad, bean sprouts and herbs. Sometimes chopped up egg rolls, shrimp, and spring onion are added to the dish. Bun cha is usually garnished with roasted peanuts. Bun ho Hue - Spicy beef noodle soup. Bun mang vit - A noodle soup containing duck and bamboo shoots. Bun rieu cua - Tomato broth with crab or shrimp paste. Fried tofu, fermented rice, congealed pig's blood (huyet), water spinach, bana flower, bean sprouts, and other ingredients also form part of the recipe. Bun oc - A noodle soup containing sea snails. Canh chua - A soup containing fish, beansprouts, pineapple, tomatoes and other vegetables. It is flavored with herbs and tamarind. Cháo - A porridge (congee) made from rice, water and pandan leaves. Chicken or other ingredients may also sometimes be added. Chao tôm - Barbecued shrimp paste on a sugar cane stick. Com ga rau thom - Rice chooked in chicken stock, and then topped with shredded chicken flavored with mint. Ga nuong sa - Grilled chicken with lemon grass. Goi du du - A salad made from papaya with shrimp, various meats and herbs. Goi cuon - Rice papper rolls containing pork, shrimp, and rice. Eaten with peanut butter sauce. This dish is sometimes known in English as "salad rolls" or "summer rolls". Mi xao don - Crispy deep-fried egg noodles topped with seafood and vegetables in a sauce. Nem nuong - Grilled pork meatballs. Pho - Beef noodle soup. Thit heo quay - Barbecued pork. This dish is often eaten at weddings, usually with banh hoi (thin noodles woven into bundles). Easy Vietnamese comfort food recipes from the winner of MasterChef Season 3. Millions of viewers tuned in to watch Christine sweep the thrilling MasterChef Season 3 finale, and here they can find more of her deftly crafted recipes. 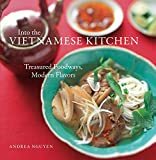 They'll discover food that speaks to the best of both the Vietnamese diaspora and American classics, personable tips on how to re-create delicious professional recipes in a home kitchen, and an inspirational personal narrative bolstered by Ha's background as a gifted writer. Recipes from My Home Kitchen will braid together Christine's story with her food for a result that is one of the most compelling culinary tales of her generation. A cookbook devoted to the beloved Vietnamese sandwich, featuring 50 recipes ranging from classic fillings to innovative modern combinations. Created by Vietnamese street vendors over a century ago, banh mi is a twist on the French snack of pâté and bread that is as brilliant as it is addictive to eat. Who can resist the combination of crisp baguette, succulent filling, and toppings like tangy, pickled daikon and carrots, thin chile slices, refreshing cucumber strips, and pungent cilantro sprigs? Bringing a new realm of flavor for anyone tired of standard sandwich fare, The Banh Mi Handbook presents more than fifty recipes and numerous insights for crafting a wide range of sandwiches, from iconic classics to modern innovations, including: Crispy Drunken Chicken, Shrimp in Caramel Sauce, Grilled Lemongrass Pork, Beef and Curry Sliders, Coconut Curry Tofu and Lettuce Wrap Banh Mi. Andrea Nguyen’s simple, delicious recipes for flavor-packed fillings, punchy homemade condiments, and crunchy, colorful pickled vegetables bring the very best of Vietnamese street food to your kitchen. The long-awaited cookbook featuring 100 recipes from James Beard award-winning chef Charles Phan’s beloved San Francisco Vietnamese restaurant, The Slanted Door. Award-winning chef and restaurateur Charles Phan opened The Slanted Door in San Francisco in 1995, inspired by the food of his native Vietnam. Since then, The Slanted Door has grown into a world-class dining destination, and its accessible, modern take on classic Vietnamese dishes is beloved by diners, chefs, and critics alike. The Slanted Door is a love letter to the restaurant, its people, and its food. Featuring stories in addition to its most iconic recipes, The Slanted Door both celebrates a culinary institution and allows home cooks to recreate its excellence.